Shore Drive is a happening section of North Myrtle Beach, South Carolina. Beach music wafts through the air and volleyball games take shape on the white sandy beaches up and down Shore Drive. Sands Beach Club is a beautiful North Myrtle Beach resort right on the oceanfront. This oceanfront North Myrtle Beach resort features spacious North Myrtle Beach condominium rentals and each one has a terrific oceanfront view. This North Myrtle Beach resort also has an indoor/outdoor swimming pool, hot tub, tennis courts, basketball court and volleyball court. There are so many ways to enjoy your North Myrtle Beach vacation when you stay at Sands Beach Club. Play in the water, swim in the ocean and challenge your family and friends to a variety of other sports that are accommodated at Sands Beach Club. All of this is in addition to the live entertainment theatres, shopping, dining and water sports that are featured in the area. Sands Beach Club nicely caters to active families. The sparkling blue swimming pool is both indoors and outdoors. Just swim through the window that separates the two spaces. 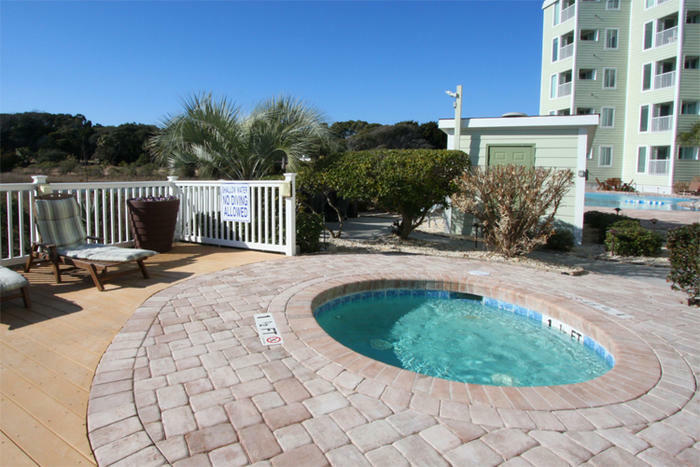 An indoor hot tub is a wonderful retreat during your North Myrtle Beach vacation after you have played 18 holes of Myrtle Beach golf or walked through every one of the outlet stores at Tanger Outlet Center. An on-site restaurant and lounge allow you to get a bite to eat with ease. Take the elevator downstairs and take a look at the menu where your family can eat without having to make your own meal or driving to a nearby restaurant. This North Myrtle Beach resort has a nice play area where you can play a variety of sports. Bring your racquets and play tennis during your North Myrtle Beach vacation. Hit the volleyball courts for a team challenge and play one-on-one on the basketball court at Sands Beach Club. Afterwards go for a refreshing swim in the indoor swimming pool or lounge poolside and get some sun in the outdoor pool. You can even hop into the Atlantic Ocean which is right in your backyard. The North Myrtle Beach vacation rentals at Sands Beach Club are all two bedrooms. These spacious North Myrtle Beach rentals can sleep up to six people. These condos in North Myrtle Beach, South Carolina have two full baths, a well equipped kitchen and a gorgeous oceanfront balcony. All of these North Myrtle Beach condominiums have Internet access. The kitchen in each of the Sands Beach Club North Myrtle Beach rentals has full-size appliances, including a dishwasher. There is at least one DVD player in these North Myrtle Beach rentals so you can watch a movie during your North Myrtle Beach vacation. All of these condos in North Myrtle Beach, South Carolina are non-smoking units. Some of these North Myrtle Beach condo rentals have their washing machine and clothes dryer. Additionally, each floor at Sands Beach Resort has laundry facilities. Elliott Beach Rentals is not affiliated with onsite management or the HOA of Sands Beach Club.